The Weather Channel's new video series on climate change features 25 stark messages aimed at conservatives. The Weather Channel has a new video series of stark messages on climate change aimed mostly at conservatives. On Wednesday, the Weather Channel launched a dramatic campaign it says is intended to help shift the climate change conversation from science to solutions. The 25 black-and-white segments seem inspired by TED talks—short, two- to three- minute video essays by influential speakers with interesting perspectives. They were produced with help from one of the producers of Showtime’s Emmy-winning documentary Years of Living Dangerously. Often, the speakers in Climate 25 make direct eye contact with the camera, and the effect is gripping and memorable—like a blunt Ad Council PSA. Taken together, the series is one of the best-produced summaries of climate risk I’ve ever seen. The Weather Channel’s TV audience skews older and more conservative than the general public, and that’s exactly the people who are most resistant to taking action on climate change, per recent polling data. (Prospectors, a Weather Channel reality show about looking for gold and gems in the Rocky Mountains, was among Republicans’ most beloved in 2014.) 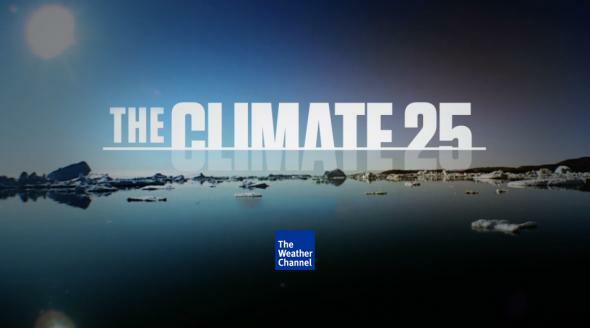 With Climate 25, the Weather Channel made a conscious decision to confront these viewers head on, using voices the channel’s executives thought would be relatable. The network has frequently made the connection between extreme weather and climate on air, and last fall, it released a public position statement that warned of “radical and irreversible changes.” But this is the closest it’s come to outright advocacy on climate action. In keeping with the often apocalyptic tone of the Weather Channel’s website, most of the messages are framed with bold phrases, like “this is the beginning of real trouble in our world” and “the status quo is long gone.” Still, there are a few cheesy moments, like Polman saying the world’s business leaders can actually stand to make money by acting on climate—“have your cake and eat it, too”—while taking a big bite out of a cupcake. Some of the most powerful clips, like the one below made by a Syrian refugee, talk about how climate change is already affecting human health, national security, and the economy. Over the last year, the Weather Channel has scaled back on kind-of-weather-related reality programming like Fat Guys in the Woods and Highway Thru Hell after high-profile spats with cable providers. But it still relies on a clickbait-heavy Web presence to drive revenue in a rapidly changing market for weather information. Its free mobile app is one of the most popular on the market, and the company has been a master at squeezing extra ad revenue out of localized weather forecast information using algorithms that predict consumer behavior—like an increased preference for raspberries in Miami on certain January mornings. The video clips are set to appear on the Web, mobile, Facebook, and in five thematic “mini-episodes” during live programming on air through June 14.